Following the modest success of his pop/hip-hop duo, Heyyo, Matthew Fell (junior telecommunications major, music tech minor) has recently debuted three songs from a promising self-entitled solo project. Earlier in the month, the local artist prescribed us all a taste of two originals: “Best Thing So Far” (folk-pop) and “Walking These Streets” (electronic indie-pop.) However, what sets his latest release, “Catch Me If You Can,” apart from the rest is the degree to which it showcases the very thing that drove Heyyo to obtain its immediate 50,000+ plays: Fell’s catchy vocal riffs and amazing production skills. 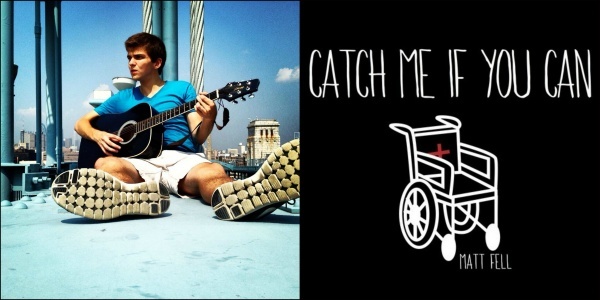 In a brief interview, Matt expressed that “Catch Me If You Can” was written to both lyrically and melodically convey the breaking of routine to achieve a goal on your own terms. Perhaps a commentary on society at large, the lyrics illustrate the well-known discouragement that derives from falling into a seemingly generic way of life. Especially at our age, it’s so easy to just follow the path that has been placed before us, even if we know it’s not the one that will truly make us happy. Matt Fell inspires us in the chorus to reject what society tells us should make us happy and pursue the thing that could fulfill our own, unique lives. He exceeds at proclaiming his admirable message sonically by experimenting with his songwriting, showing the world that he really is stepping outside of his comfort zone. I’m an advocate of pursuing your dreams, I’m an advocate of going against the grain, and I’m an advocate of Matt Fell and the talent he has yet to share with the world. Catch him if you can because he’s about ready take off. Support local music: give it a listen, like, and share!